RUN-D.M.C. 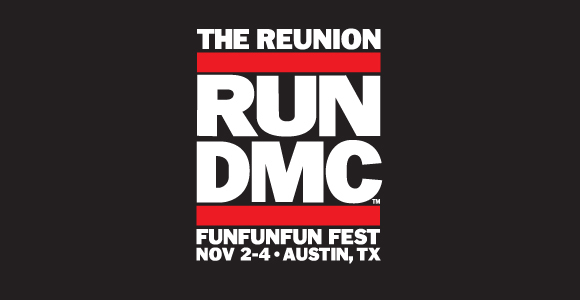 is the latest addition to take part on the 7th annual Fun Fun Fun Fest in Austin, Texas on November 2-4, 2012. This will be the first time the two surviving members of the group, Joseph “Run” Simmons and Darryl “DMC” McDaniels will be performing since their untimely end in 2002. They will be on the main stage along with other announced acts such as Atlas Sound, Baroness, Black Moth Super Rainbow, Starfucker, Rakim, Lagwagon, The Head and The Heart, Danny Brown, David Cross, Bob Mould, Tomahawk and Against Me! On Wednesday, July 11th, a bingo session will be held at the Lucky Lade Bingo Hall from 11 pm to 1 pm. The full lineup for Fun Fun Fun Fest will be announced on Thursday, July 12th at www.funfunfunfest.com. Tickets will be going on sale on the same day. For two decades, RUN DMC were one of the best recognized acts from the 1980s New York hip hop scene, sporting a then street look with leather jackets and Adidas sports wear. The Hollis, NY based group were one of the first hip hop acts to have videos played on MTV, and eventually entered the Rock N Roll Hall of Fame in 2009. Jason “DJ Jam Master Jay” Mizell was murdered in 2002 at his recording studio in Queens.